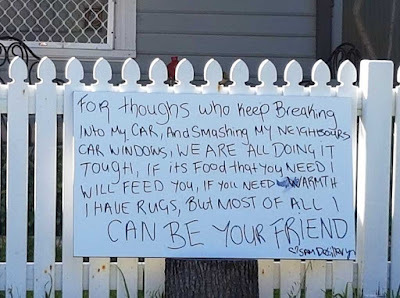 A woman from Perth, Australia, has posted a sign outside her home offering the burglars "food, warmth and even friendship" if they stop breaking into her car and her neighbours’ homes. 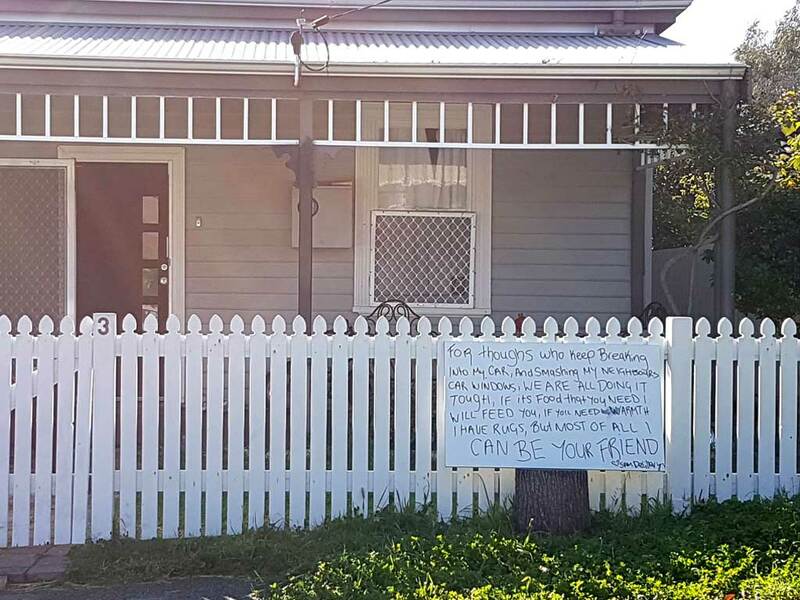 Sam De Sillery put the sign on her front fence on Friday after her car and seven of her neighbours and friends' vehicles were broken into or had their windows smashed over two days. "For those who keep breaking into my car, and keep smashing my neighbour's car windows, we are doing it tough," she wrote. "If it's food that you need, I will feed you. If you need warmth I have rugs, but most of all I can be your friend." Ms De Sillery said no one has yet taken up her offer, but she was genuine about helping out anyone who was stealing to buy food. "I know it's hard to find work and there are a lot of people doing it really tough," she said. 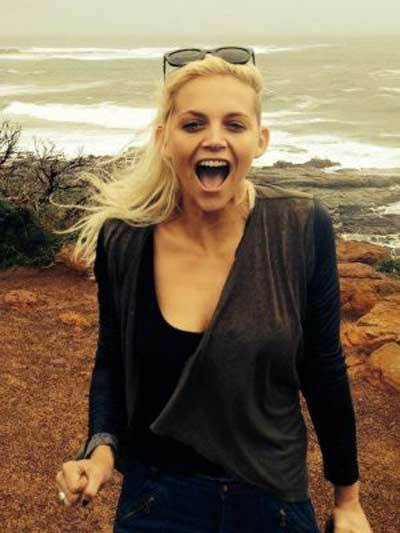 "I'm a single mum, so I know how tough it is and I get by through sharing food and support from family and friends. So instead of being angry I decided to put the sign up because I thought maybe I could help." 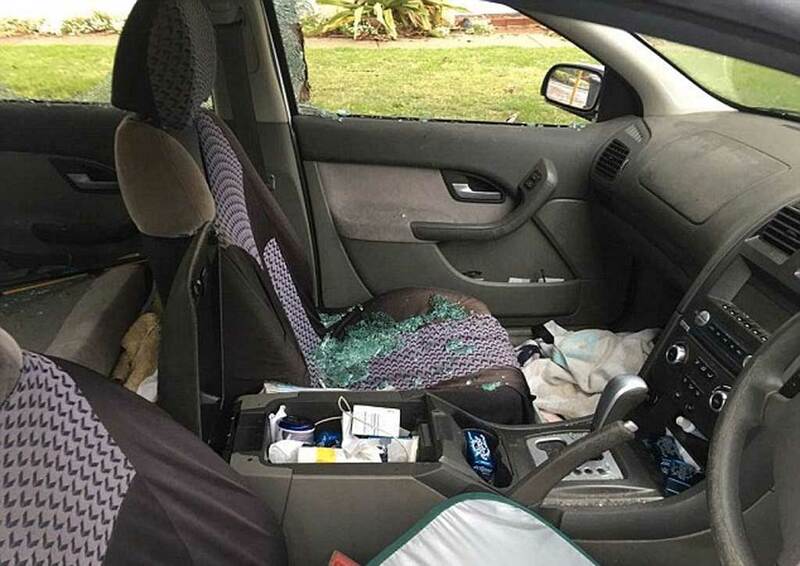 The 28-year-old mother-of-one said many of her neighbours left their cars unlocked, as it was costing too much to replace smashed windows. "I've had my car broken into twice this week," she said. "It never used to be this bad. My friend's garage got broken into and they stole a hose and reel. I mean you might get five dollars on Gumtree for that. So many of the crimes are petty, so that's why I thought they might just need some food or something like that." Ms De Sillery is planning to keep the sign up for a little bit longer given that no one in her street has been robbed since she erected it.